WHAT ARE CAKE DECORATING EVENT/CLASS PARTIES and WHAT IS CONSIDERED AN EVENT? WHAT TYPES OF CAKE DECORATING PARTIES MAY A GROUP CHOOSE FROM? WHAT ARE THE PRICES OF THE EVENT PARTIES? THE PRICES WILL DEPEND ON THE TYPE OF EVENT AND THEME YOU ARE CUSTOMIZING. MOST PACKAGES START AT $18.00-30.00 PER PERSON AND SOME HAVE A FLAT FEE . SPECIAL RATES ON GROUPS OF 15 OR MORE. SOME SAMPLE PACKAGES ARE LISTED BELOW. PLEASE FILL OUT CONTACT FORM FOR AN ACCURATE RATE. 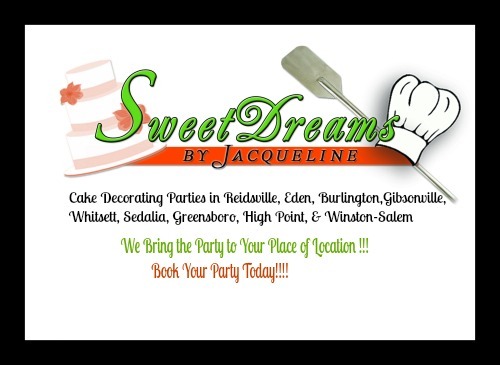 DISCOUNTED RATE IF YOU ORDER A SEPARATE CAKE FOR THE EVENT FOR THE PARTY TO ENJOY!!! PRINCESS DOLL BIRTHDAY PACKAGE ~RATE $225.00 FOR BIRTHDAY PERSON & 8 GUEST. REQUEST FOR NUMBER OF GUEST, DATE & LOCATION FOR A QUOTE.